Best Life Insurance Plans & Policies Today!! Get Highest Protection, Tax Saving & Low Yearly Premiums. Apply, Get Free Quotes . 1000% Financial Security for your families future. Apply & Select the Best Term plan today!! Compare Online & Offline Term Plans from top companies in India. Free no-obligation to buy. Term Insurance Policy is a no frills life insurance plan and it covers your life for a term of one or more years. It pays a death benefit only if a person die's within the term period. Term Insurance generally offers the cheapest form of insurance, because it does not offer any residual value on maturity. You can renew most Term Insurance policies for one or more terms even if your health condition has changed. Each time you renew the policy for a new term, premiums may climb higher. Term insurance policies, cover only the risk during the selected term period and some times it is also called as "pure risk policy". 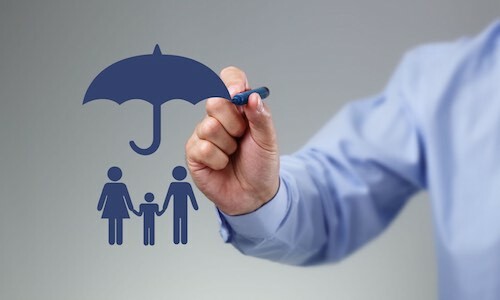 Term Insurance is the simplest, traditional and the also cheapest life insurance available.If the policyholder survives the term, the risk cover comes to an end or if the policy holder dies in between the term period his family members or nominee receives the insured amount by the insurance company. There is no limit to the amount of insurance cover you can buy for your self, but it is advisable that your should least have 8 to 10 times of your yearly income as term insurance cover. The logic behind this calculation is that in case you suffer a sudden loss of life, your family or dependents should have sufficient amount to sustain the expenses for atleast 8 to 10 years. A Term insurance plan is a pure risk cover plan and it also meet the needs of people who are initially unable to pay the larger premium required for a whole life or an endowment assurance policy, but they hope to be able to pay for such a policy in the near future. There are a few insurance riders or "add on" which can be clubbed with term insurance policies by paying additional premiums. As of now there is no need for a medical check-up if you buy a term insurance for Rs. 5 lacs cover, till the age of 45 years. " The insurance premiums differ with age , health condition and whether you smoke or drink alcohol, the insurance premiums are the lowest in the early years and gradually increase with age ". A term insurance plan is a quintessential part of our financial portfolio. If it is not in yours too, it should be. A term insurance plan is the only instrument capable enough to fulfil your protection needs where you can leave a lump sum amount for your family’s financial requirements in case of your premature death. The corresponding premium outgo is small and the coverage is thus, easily affordable for everyone. Not having a sufficient level of coverage is now a thing of the past as a term insurance plan overcomes this hurdle through its unique structure and plan benefits. Since we have established the importance of having a term insurance plan, the next obvious step is to invest in one if you have not bought a plan already or review your coverage if you have bought a plan but do not know the optimum level of coverage required. So, which category do you fall in? •	No coverage – in spite of the importance of a term insurance plan, many of us ignore to have a term insurance cover on our life. Some blame it on lack of awareness, some on lack time and money while others feel that the plan is no good as there is no maturity benefit. Lack of awareness can be solved by knowledge but the lack of time and money and the aversion to term plans is a psychological concern. One has to take out a little time to insure his life for his family’s financial future and since online term insurance plans are now available, the time factor is easily solved. The lack of money is also a joke as term plans are exceptionally cheap. They require a premium of few thousand rupees against the high cover granted. As far as the plan benefits are concerned, term plans are meant as a protection tool which would provide finances in case of an exigency. If you desire a maturity benefit, you can buy term plans with return of premium options which return the premium paid on maturity. Thus, a term plan is important and if you have not yet invested in one, you should do so immediately. •	Reviewing an existing coverage – though many of us have avoided a term plan, some of us have been wise and have already invested in a term insurance plan. While I applaud their foresightedness, the coverage level should also be considered. A term insurance plan is fruitful only if the coverage is in proportion to the expected lifestyle expenses. a little cover is useless and if you are already covered under a term plan, you should review your coverage level. For doing so, our term insurance calculator helps in determining your optimal coverage level. The calculator is simple and easy and being online, is also convenient. So, you should review your coverage immediately. If your ideal coverage falls short of your existing cover you should plug the gap and buy another plan. So, whatever your scenario, buying a term plan would be the base line and when you look to buy a term insurance plan, you would be swamped with offers from multiple insurers to try their plan. Each insurer touts its plan to be the best in its category and it thus becomes confusing to arrive at one option to fulfil your needs. While term insurance plans are basically the same, there have been various innovations in the insurance sector. These innovations have redefined the simple term insurance policies and the policies available today are loaded with attractive features. One plan boasts of one benefit while the other plan boasts of something equally competitive. In this scenario, comparing between the available term plans is the only ideal solution. •	The coverage level – though most term insurance plans allow unlimited Sum Assured option, there are plans which allow only a limited Sum Assured. First you should assess your ideal coverage level and then look for the availability of such a level in the available term insurance plans. a) Level Term Plan – this is the most basic and the simplest plan variant. It is the common term plan which pays a lump sum death benefit on death of the insured. The death benefit is equivalent to the Sum Assured chosen by the policyholder and the benefit is payable only if the insured dies during the chosen plan tenure. b) Increasing Term Plan – under this form of term insurance plan, the Sum Assured chosen at plan inception increases every year by a pre-fixed percentage. This increment in the Sum Assured continues till a maximum limit. Whenever the insured dies during the term of the plan chosen by the policyholder, the Sum Assured which is applicable in that year is paid. This type of plan is beneficial for those who would have increased liabilities in future and would need an increased coverage later on. c) Decreasing term plan – this plan is the opposite of Increasing Term Plans where the Sum Assured decreases every year by a specified amount. These plans help in covering outstanding values of loans where the amount of decrease coincides with the loan instalment cleared by the borrower. d) Term Plan with Return of Premiums – this plan is ideal for those individuals who are looking for a guaranteed maturity benefit from their term insurance plans. These plans are term plans which pay a lump sum benefit on death of the insured within the plan duration. Moreover, if the insured survives the plan tenure, a maturity benefit is also paid which is equal to the total premiums paid during the plan tenure. •	Premium Paying Terms – term plans may ask for a regular premium paying tenure where premiums are payable for the entire duration of the plan or for a limited premium paying tenure which demand premium payments only for a limited tenure. You should choose the plan depending on the premium paying tenure which best suits you. •	Plan tenure – the plan tenure is also relevant in making the purchase decision. Since term plans come with definite plan duration, this is an important consideration. The ideal tenure should be as high as possible to ensure coverage till the maximum possible age. Choose the plan which allows the highest plan tenure or covers till the maximum age. •	Premium for term insurance plan – comparing the premium rates is essential to understand whether the rates are proportional to the coverage feature provided. Usually term plans are alike and so the rates are also more or less similar. However additional features charge additional premiums and the rates differ across insurers. After you have compared the above factors and are shortlisting insurance plans, compare the term life insurance quotes of all plans. •	Available discounts – some term plans allow discount if the policyholder opts for a higher level of Sum Assured or chooses to pay the premiums in annual and half-yearly modes, discounts might also be allowed for being a non-smoker or for other factors. These discounts reduce the premium charged and are thus very economical. So, if the plan allows a discount, you should settle on such plan. So, now you know what features to look at when you compare the available term plans and settle on the best plan which your money can buy. Knowing the parameters was the first step but how can you compare the available plans? Where would you get the knowledge of the available plans which would enable you to buy the best term insurance plan in India? Don’t worry; we help you to do exactly that. We also have a term insurance calculator which allows you to first calculate the required level of coverage and then our best term insurance comparison tool which helps you in comparing the available term insurance plans easily through our online portal. The entire process takes less than 10 minutes and enables you to buy the best term insurance plan in India. You need to visit www.policyadvisor.in, provide the required details and our executives help you in settling on the best available term plan which matches your exact needs. So, find out your requirement and use the best term insurance comparison in India tool to compare term insurance plans available and buy the one which actually suits you. 2. Find the optium term insurance cover - Don't overbuy. 3. Ideal Term Insurance Cover = 15 x Your Annual Income. 4. Term Insurance is not an investment. 5. Don't compare term insurance only on Prices, look for stability & background of the company. 6. Do not fall prey to Freebies/Cashbacks. Comparing term insurance before you buy is advisable, but in case you have a doubt on how much term insurance cover you actually need, we have developed a simple term insurance calculator to help you find your right term insurance need. It's a free online term insurance calculator and takes less than 2 minutes to get the right answer. Link is given below. Click here to try our term insurance calculator.